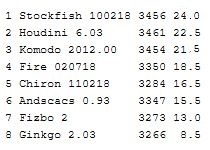 Stockfish and Houdini are in the lead, but Komodo is the winner of RR5 with 5.5/7 points. The gap between Houdini and Komodo is down to one point, making the race for the superfinal interesting. At the bottom Fizbo had 2 losses in the RR, increasing the gap to Andscacs by a point. Komodo - Ginkgo: Ginkgo chose to trade a R and pawns for BN early in the game, Komodo is an expert in these situations and its eval started to increase. Ginkgo then added to the imbalance by trading RB for Q, leading to a QBN vs RRN position. Komodo attacked the black king and the black pieces defended passively, the 3 extra black pawns were no compensation. The game was adjudicated just before Komodo gained material. Stockfish - Houdini: Stockfish had an eval advantage after the opening. For a while the engines shuffled behind their pawn lines. Houdini gave a pawn to open the queen side and threatened the white king, Stockfish's eval started to increase when it seemed the white king was safe. The eval peaked over 1.5 but then dropped after Houdini gave two more pawns and found a perpetual check draw. Houdini still without loss in the division. Houdini - Chiron: Houdini sacrificed a bishop for pawns, opening the king side to create a deadly attack on the black king. The game was over quickly. Fizbo - Komodo: The game was balanced for the first 40 moves. Fizbo sacrificed a bishop and exposed the black king, but it soon realized it miscalculated and that Komodo could find a defence. When the attack was over Komodo was still a piece up in a winning Q vs QN ending. This was Komodo's first win against Fizbo in the division. Komodo - Andscacs: Komodo was ahead on eval despite being a pawn down and Andscacs having a bishop pair. In a series of exchanges Andscacs traded down to an imbalanced QN vs RRB position, with evals over 1.5. It took a while but Komodo had no real problem to convert the win. This is Komodo's 3rd win in the RR, still in the race for 2nd place. Stockfish - Fizbo: Stockfish had an eval advantage in a closed position. Evals started to increase as the position opened up, Stockfish had a pawn majority on the queen side which later became a passer. Together with a back rank attack on the black king this was enough for a win. Houdini - Ginkgo: The game reached a RB vs RB position on move 28. Houdini's eval was over 1, it had a pair of connected passers on the queen side while Ginkgo had a central passer. When Houdini started to push its passers Ginkgo was forced to give its bishop to stop them, resulting in a won B vs pawns ending. Andscacs - Ginkgo: Andscacs took advantage of Ginkgo's uncastled king, sacrificed a knight and attacked through the center. Evals jumped over 2 on move 15 and over 4 by move 22. Andscacs got the material back while Ginkgo struggled to get its king to safety and its pieces developed. The game ended with Andscacs in a QR vs QB position with Andscacs two pawns up. After this win Andscacs' gap to Fizbo increased to 2.5 points. The game was balanced for over 40 moves, with evals very close to 0. The engines gradually exchanged pieces until reaching a RB vs RB ending on move 44. Komodo had a passer that Chiron had to watch, all other the pawns were static and invisible to the bishops. Komodo's eval started to increase, it kept the white king on the king side while moving its king to the queen side. There the black king was safe and applied pressure on the weak a2 pawn. Komodo then used the bishop as a blocking piece, it isolated the a pawn so the rook couldn't protect it and captured it. At this stage Chiron admitted defeat. The PV showed a possible rook for bishop sacrifice to remove the queen side pawns and create new passers. Komodo's fourth win of the RR, second win in black.